DALI cables can be wired next to normal mains carrying wires reducing the need to segregate the control wires. Thanks to a high signal to noise ratio and wide ranges for the digital signal, it is virtually impossible for the DALI data signal to be affected by interference. NOTE: DALI is not defined as a SELV (Safety Extra Low Voltage) system. 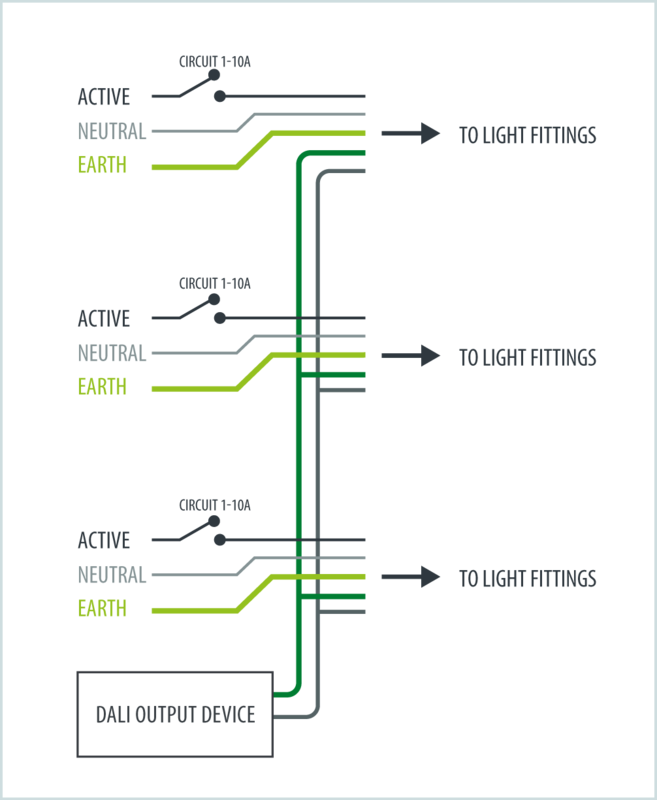 This means that normal wiring rules that would apply to normal power circuits will apply to DALI wiring. The DALI line can be run up to 300m using 1.5mm squared cable. The DALI specification allows for maximum 2V drop in the communication signal. The DALI line does not require termination of the line and supports all wiring typologies except rings and closed loops (trees, branches and chains are all acceptable). The DALI line is a 4 or 5 wire system (requiring active, neutral and two control wires). An earth wire is required in single insulated devices. A DALI line can be connected to a maximum of 64 DALI type devices. Every DALI line requires a DALI power supply. The DALI power supply is a current limited device ensuring that the line current does not exceed 250mA. A DALI control system can be connected at any position on the line. If the control system adheres to the DALI standard protocol, multiple control systems can exist along the same line. A DALI power supply can be wired at any position along the line wire and is used to facilitate communication between the DALI devices and the control system. The DALI power supply will continue output between 9.5 and 22.5 volts on to the control wires while there is no communication. DALI devices will respond to the control system by shorting the two control wires together. Note: A maximum of 64 DALI devices can be connected to a single line. The number of circuit breakers required may change based on the wattage of each DALI device. Because all DALI fittings are supplied with a switched active supply, there is no added need for any extra circuit breakers or wiring. The same setup can be used for DALI lighting. DALI emergency lighting or mixture of DALI and DALI emergency lighting: Due to the fact that the DALI wires are NOT SELV, normal wiring rules apply and this allows the DALI cables to be wired with the normal mains ratted cable. A backup generator can be wired directly to all supplies without consideration of the load. During commissioning, the load and fittings required to be powered by the emergency generator are selected and then programmed. A control system can even be programmed to control the load and turn on more fittings as the generator stabilises. There is no need to separate fittings that need to operate 24 hours a day onto a separate supply. Fittings that are required to operate 24 hours a day can be programmed when the site is commissioned.